GOBO is a popular term used in the lighting and events industry for the projection of text, logos and/or abstract images onto event space surfaces via the use of a sharp lighting fixture or projector. The monograms can either be animated and displayed via digital projectors or ‘static’ and remain constant by means of shooting light through a “GOBO.” GOBO stands for goes before optics. A metal or glass disc is inserted into the light fixture before the optics output to block light from most areas and only allow the words or image to shine through to the wall. Where does the monogram projection shine? Literally anywhere flat. We have projected monograms onto dance floors, ceilings, walls, stone facades, building entrances, dark glass, ship hulls, residential home roofs, baseball diamonds and so many other unusual locations. 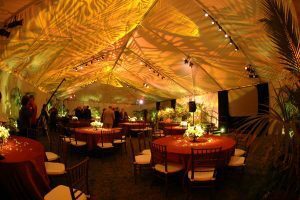 With our Monogram Lighting services you will work with an event lighting and design specialist to select the prime location(s) for your monogram(s) or you can select a place you prefer. Some venues (such as Cruiseport in Gloucester, MA) have special areas and electrical connections for lighting companies to project monograms onto stand-out surfaces. What are my Monogram design options? A monogram can be any design involving light patterns. It can be as simple as a few short lines of text or an abstract projection of stars on the ceiling to fit your night sky theme. With weddings and other formals, it is most popular for a couple to project their names and wedding date using a single monogram. Our staff works with you to design and project custom wedding monograms. Corporate clients utilize monograms for vibrant branding opportunities. Our educational clients often project their school mascot. 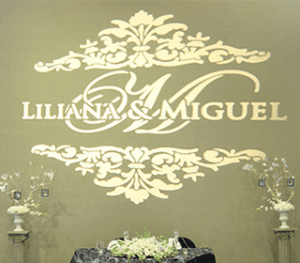 Some events use multiple monogram projectors to light the event space with specialty patterns. A recent winter formal projected 70 large snowflakes on the otherwise dull air dividing walls of a hotel ballroom. Another client held a fall themed event and had animated falling leaves around the walls and dance floor. How soon should I order a monogram? Monogram designs must be finalized no later than 30 days prior to your event. Rush service is available for an additional fee up to two weeks prior to the event. If you add a monogram less than two weeks before your event a static digital projection only is available. Each event monogram is designed to client specifications. Examples of custom, non-abstract monogram templates are displayed below.